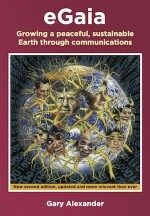 I’m Gary Alexander, the author of eGaia, Growing a peaceful sustainable Earth through communications. I developed the positive vision of a sustainable future described in it over many years, as you can see from my papers and talks. I’ve been working to implement these visions through a range of community projects to ‘re-invent community’ to create a ‘connected community’ that is sustainable and in which people work for mutual benefit. As many such local communities develop and are linked regionally, nationally and globally they will form ‘Earth Connected’, an organism-like global culture. I have recently completed a 4 year term on the Board of Trustees of the Transition Network, which I think of as on the leading edge of cultural change in the world today. Transition Network supports community-led responses to climate change and shrinking supplies of cheap energy, building resilience and happiness. I retired from the Technology Faculty at the Open University after 37 years, where I was a pioneer in putting distance learning on-line, with an emphasis on collaborative learning and on-line support communities.